Fire HD 8 Case - Zerhunt Ultra Light Slim Fit Protective Cover with Auto Wake/Sleep for Fire HD 8 Tablet (7th and 8th Generation, 2017 and 2018 Release) Black. Special Design For - Full protection for All-New Amazon Fire HD 8 Tablet (8" Display,7th Generation, 2017 release). Also compatible with Fire HD 8 previous generation 6th (2016 Release). Ultra-Light - The weight is only 0.3Ib which is much lighter than most case on market.Add almost NO weight to your tablet, Provides convenience for you while travelling or business trip. 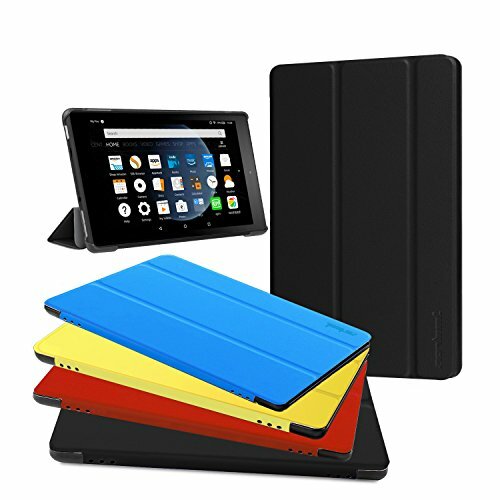 Lifetime Warranty - If have any problems with your Zerhunt fire HD 8 case cover, you are always welcomed to contact us for exchange or refund as per your preference,That's why we get so much 5 star reviews.